Spring Creek Mechanics' Institute and Public Library (name changed to Fawcett circa. 1908). On this site from 1882. The Mechanics' Institute movement began in British urban industrial centres in the early 1800s. A "mechanic" was a person applying skills and technology. 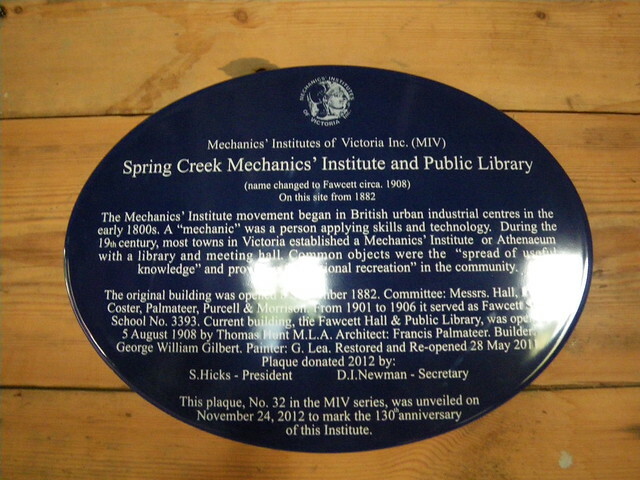 During the 19th century, most towns in Victoria established a Mechanics' Institute or Athenaeum with a library and meeting hall. Common objects were the "spread of useful knowledge" and provision for "rational recreation" in the community. The original building was opened 8 September 1882. Committee: Messrs. Hall, Long, Coster, Palmateer, Purcell & Morrison. From 1901 to 1906 it served as Fawcett State School No. 3393. Current building, the Fawcett Hall & Public Library, was opened 5 August 1908 by Thomas Hunt M.L.A. Architect: Francis Palmateer. Builder: George William Gilbert. Painter: G. Lea. Restores and Re-opened 28 May 2011. Plaque donated 2012 by: S. Hicks - President; D. I. Newman - Secretary. This plaque, No. 32 in the MIV series, was unveiled on November 24, 2012 to mark the 130th anniversary of this Institute.